are the lawyers? Is it a fake? images from German hip hop site WebBeatz. So, what's the mixer itself? It's not clear: it's an early prototype. In one of the photos of the actual prototype, the iPods aren't even plugged in. 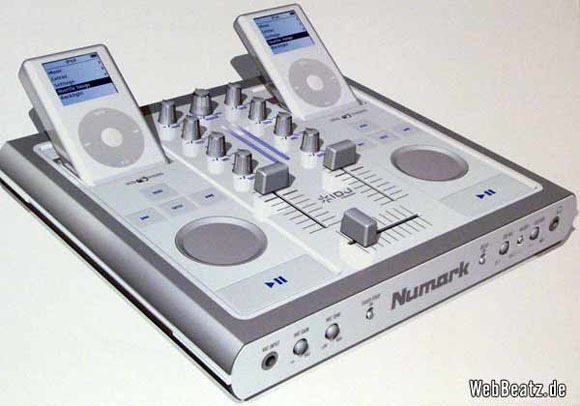 other words, all the normal limitations of the iPod for DJing apply. Don't expect this to ship any time soon. We'll continue to follow this story, including a check-in by CDM's resident DJ, DJ Eldorado. In the meantime, people continue partying with their iPods, special mixer or no — more Playlist parties in London and Philly are slated for this month.